The Cream Legbar does possess some of the feisty Leghorn traits, for the most part are decent due to the sweet natured Araucana background. 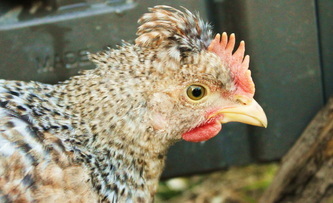 The Cream Legbar is one of the few auto sexing breeds. The girls and boys are easily distinguishable by the colour of the down. The Cream Legbar is quite old and quite rare in its true pure form. Do not be confused by my feisty Leghorn comment. These do not have any relation to the commercial type hens being used to produce eggs for the grocer. 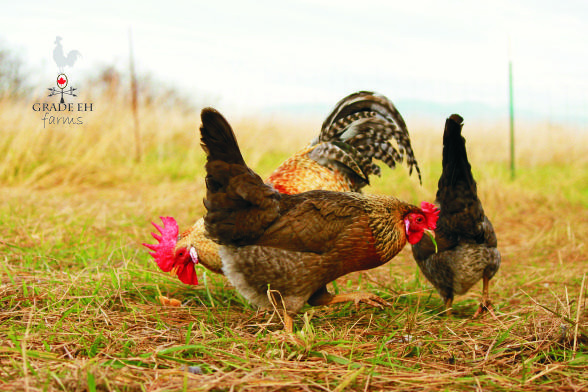 They have become immensely popular to keep as laying hens. This does not help the cause of preservation but it does assist with fresh eggs in the fridge. Do not be confused by imitations. If you cross a bird with a blue egg to a Barred Rock chicken it does not create a Legbar. There are minimal decent strains remaining in its true form. Our Legbars were imported, not created here. There are plenty of people selling what they think are Legbars. Buy from a trusted source if you intend to have a breeding program. We offer both the crested Cream Legbar and the non crested variety. All are kept together, so you never know what you might get. We like surprises here too. You can also check our Available Now for special offers. *This page was first published in Spring 2013. Photographs and write ups are by the farmer, Matthew Nelson. They are the property of the Nelson family.